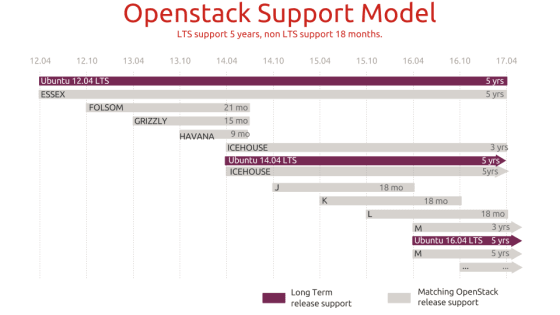 Ubuntu was the first platform to embrace OpenStack, and OpenStack development largely happens on Ubuntu. As the reference platform for OpenStack, the majority of production deployments of OpenStack are on Ubuntu. Canonical, the company behind Ubuntu, provides large-scale commercial users with both professional services and support for OpenStack. In addition, Canonical supports Ubuntu hosts and guests in deployments that use OpenStack distributions from vendors other than Canonical. We do not restrict users to our OpenStack distribution if they want support for Ubuntu server both as a host or guest. What services does Canonical provide? Canonical will support Ubuntu for companies that have purchased a third-party OpenStack product or service for use with Ubuntu, where Canonical has a relationship with that vendor to enable effective three-way support and problem resolution. Canonical offers support in multiple regions and languages, for both business-hours test-and-dev and 24/7 production deployments. With Canonical, customers have access to a dedicated pool of technical experts to help triage and resolve issues in both Ubuntu server and OpenStack components. This is significant given that the server includes virtualization and cloud infrastructure (KVM and OpenStack) which are more complex in nature than the standalone Ubuntu server. Canonical customers also receive global, around the clock support and maintenance for packages outside the Ubuntu Main archive. Customers have the option of extending these support lengths if and when their business need arises. Canonical supports a variety of Hypervisors commonly used in the public and private clouds, including but not limited to KVM, ESXi and soon to be announced, HyperV. Guest OS support depends on the Hypervisor on which the workload (Virtual Machine) lives. On Ubuntu KVM, Canonical provides guest OS support for Windows Server and most Linux distributions, in addition to Ubuntu. In some cases, such as Windows Server, Canonical has reciprocal agreements and certifications in place, while some commercial Linux vendors have so far not certified their OS as a guest on Ubuntu KVM. Canonical is prepared to work with all OS vendors to support our customers’ choices of guest OS. We believe that a strong OpenStack ecosystem is in our customers best interest.